Self Esteem building activities offer low self esteem help to change your attitude from misery, anger, frustration and displeasure to happiness in the amount of time it takes to have a new thought. This is one of our favorite self esteem exercises. It is a powerful resource to aid you in experiencing positive self esteem, peace and happiness. A Pleasure List, is a simple list of the people, places, things and activities that result in an experience of pleasure when you think about them or do them. Simply focusing your attention fully on an item on your Pleasure List will instantly make you feel better. I was feeling frustrated and angry with myself for not sticking to eating healthy food and exercising regularly. I was annoyed that I was still dealing with the weight I had to lose. This frustration was getting in the way of any positive self esteem I might feel and leading me directly to the kitchen where I began searching the fridge and cupboards for stuff to eat. I put a bag of popcorn in the microwave. As I waited for it to pop, I grabbed a spoon and opened the freezer, ready to inhale healing spoonfuls of creamy chocolaty ice cream. As I felt the cold pint of ice cream in my hand, I heard myself say aloud, "What are you doing? This isn't going to help you take off those extra pounds!" I immediately took a deep breath and thought, 'I'm going to focus on my Pleasure List.' I imagined the sound of my grandsons' 4 year old voice and the special way he says, Thank You "Kank You." My face burst into a smile. I put the ice cream back into the freezer, without having inhaled it or even removing the lid. I left the popcorn in the microwave. I took an apple and left the kitchen, feeling good about the choice I made to support my commitment to love my body. Make a list of the people and pets who bring a smile to your face when you think of them. Make a list of the places that bring a smile to your face. Make a list of the things that bring a smile to your face. Make a list of the things you like to do that bring you pleasure. Keep your completed Pleasure List handy - write items from it on Post-Its and place it on your bathroom mirror, fridge, car dashboard, anyplace where it will capture your attention. The next time you need to change your attitude and could use some low self esteem help to jump start positive self esteem, read your Pleasure List. Then focus your attention on imagining a particular item on your list or doing a specific pleasurable activity from your list. Then enjoy the powerful impact that self esteem building activities have on how you feel about yourself. Download a Pleasure List Worksheet and use our Self Esteem Lesson Plan for more self esteem building activities. Joan Breiner, M.Ed. & Susyn Reeve, M.Ed are the founders of Self Esteem Experts providing step by step guidance on how to build self-esteem, from recognizing the symptoms of low self-esteem and understanding how the brain works to self-esteem exercises, activities, and lessons to help bring about lasting change. FREE Self Esteem E book. 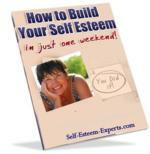 It has many ideas and exercises to improve your self esteem.